Monster storms closed the school for three days. “Carpets bubbled with mud. Green slime swallowed books.” And when the children returned, the new bookshelves in the classroom were empty. “What will we do for story circle?” they ask. With the kids sitting around her on the new rug, the teacher tells a story about a boy who loved to fly. Afterwards, she asks them what pictures they imagined. Each one sees something different: wings like yellow sunbeams, a pond that looks like a green button and cloud horses running in the blue sky. Soon, all the children are excitedly raising their hands to tell their own stories. Acclaimed children’s book author Diane Gonzales Bertrand returns with another charming book about the joys of telling stories and using one’s imagination. The short text combined with fanciful illustrations will spark conversations with children and spur them to write and illustrate their own stories. 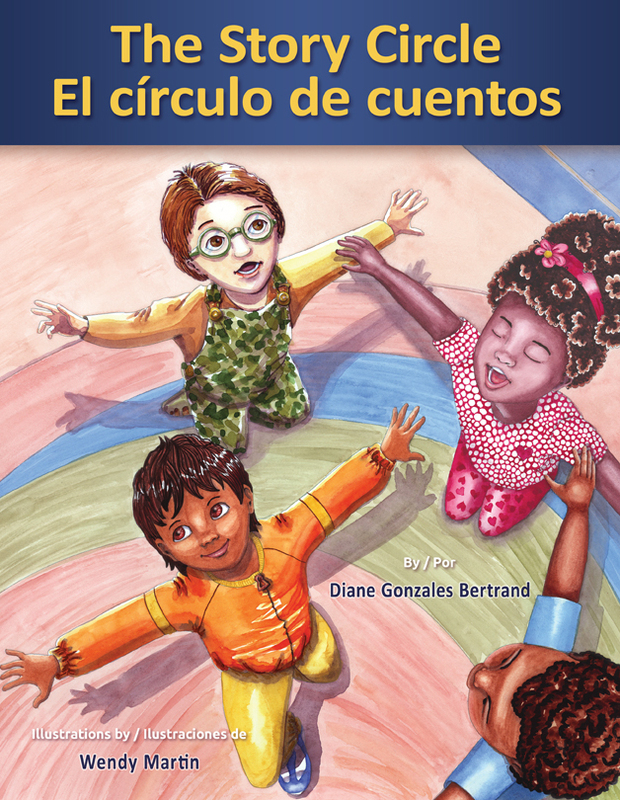 Click here to listen to an interview with Diane Gonzales Bertrand about The Story Circle/ El círculo de cuentos. DIANE GONZALES BERTRAND is the author of numerous books for children and young adults. Her picture books for children include Cecilia and Miguel Are Best Friends / Cecilia y Miguel son mejores amigos, A Bean and Cheese Taco Birthday / Un cumpleaños con tacos de frijoles con queso and The Empanadas that Abuela Made / Las empanadas que hacía la abuela. A native of San Antonio, Texas, she teaches writing at St. Mary’s University where she is Writer in Residence. A transplanted New Yorker now living in Missouri, Wendy Martin has worked as an illustrator for more than 25 years. She has written and illustrated several picture books for children, including An Ordinary Girl, A Magical Child, which was a finalist for the 2009 COVR Visionary Awards. She earned a degree in Fashion Design from the Fashion Institute of Technology, and then continued her art education at the School of Visual Arts, earning a B.F.A. in Graphic Design.